Everything’s inverted this episode, as Ivan From Phoenix returns as guest host, interviewing Mark Devlin upon the release of his new book, Volume 2 of Musical Truth. 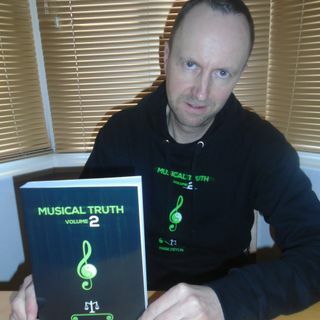 Musical Truth Volume 2 is available in paperback now via Amazon. Hardback and Kindle versions will be available shortly. The author is also able to send out signed copies to anyone who can pay by Paypal. Please e-mail markdevlinuk@gmail.com to arrange this. Mind control and social engineering through Electronic Dance Music. Social Engineering, Culture Creation, and Lifetime Actors. CHAPTER 4. EVER GET THE FEELING YOU’VE BEEN CHEATED? GOODNIGHT! How Punk and New Wave kept the counter-culture control grid going strong. How justified is Heavy Metal’s perceived association with Satanism and the dark occult? And why should there be any connection between these elements and the music scene in the first place? How the science of sound frequencies - the building blocks of this ‘physical’ reality - lies at the root of music and mind-control. CHAPTER 7. IS NOTHING SACRED? Reflections on apparent cult influence from the earliest days of hip-hop culture, and the systematic toxification of what remains. CHAPTER 8. IS ‘PAUL’ PAUL? Navigating the labyrinth of Prince and George Michael death clues. Decoding 1980s pop videos through a new set of lens.